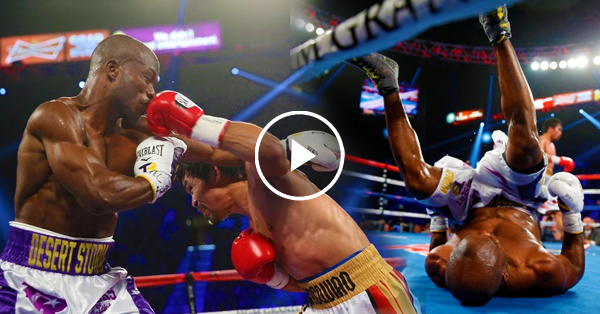 WATCH: Pacquiao defeats Bradley in his final fight and made him roll on the boxing ring! Home / News / WATCH: Pacquiao defeats Bradley in his final fight and made him roll on the boxing ring! Once again, the People's Champ, Manny Pacquiao has brought pride to our country after winning a boxing fight over Timothy Bradley on Sunday. The third boxing match of Pacquiao and Bradley was entitled "Pacquiao Bradley 3" and was held at the MGM Grand Garden Arena in Las Vegas Nevada. Manny Pacquiao wins over Bradley after the judges had a unanimous decision that was in favor of Manny Pacquiao. The judges then consider this as a great win for Pacquiao since this his last battle on his boxing career. But what really caught everyone's attention in the fight of Manny and Bradley is when Manny threw a punch to Bradley and as a result, Bradley fell from his back and unbelievably rolled on the boxing ring. People claim that this is indeed one of the best fights of Manny Pacquiao and is considered as one of the most remarkable.